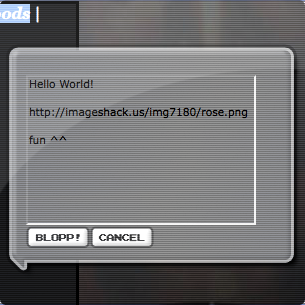 Blopps is a web service to post comments, it offers a Firefox add-on that allows you to post your comments, links, and pictures on any website. It is easy to use it, just this Firefox add-on, restart your browser, you will see a green icon on toolbar (red is off). 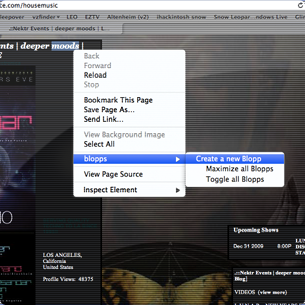 Now you can use it, go any website, if you want to post your comments, links, or picture, just highlight text, right click with your mouse, on context menu choose "Create a new Blopp". It will display a small window, you can type comments, links. If you want to post a picture just type that picture's link. Click "Blopps!" button all done. If someone also had comments there you can see these comments. You can post your comments without register, but create an account that lets you to rate any comments. Actually, Blopps is an independent comment platform, your comments do not appear on original website, it only displays on Blopps comment platform. So more users will get more comments, but it is still a useful comment tool.